It's been a strange week, this one. The daughter was ill last weekend and the early part of the week and on top of that we're changing childcare providers. The Wife and I are both very busy at work with deadlines looming, so we split up the childcare while we introduce her to the new nursery. So Monday, Tuesday and Wednesday I was in charge. On my own. Thankfully, we'd had some practice at the beginning of September when The Wife had a conference to attend for work so I was in charge for a few days, but then I had the help of my friend Paul who we were staying with, who has a nine year old daughter of his own, and hence is far more experienced than I. But this time it was just me. As a result of the sleepless nights while she was ill, we didn't have a Games Night to give us a chance to catch up. Seeing as I was off work with The Daughter at the beginning of the week, I missed Tuesday lunchtime's Codename: Vacuum playtest session too. My parents came up last night, so I skipped Saturday's Newcastle Gamers session to prepare for their visit. So from a gaming point of view it's been a dry week. 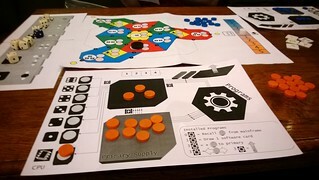 The new Vacuum has had a lot of changes, so I really need to focus on trying them all out and finding and improving the weaknesses, so next week I hope to get back to lunchtime playtesting and then there's another Newcastle Playtest meetup on the 5th, so I'll take it along to that too. In other news, I've been thinking about Codename: Proteome again, and in my head have made some sweeping changes. I'm considering giving it a go for NaGa DeMon, the game designer's equivalent of NaNoWriMo. So not much to report this week, but stuff is afoot! In other news, 700th post! Who'd have thought Creation and Play would last so long? The next morning I tried out a few cleaning and calibrating cycles on the printer and managed to get it to play ball, but the prototype was printed before I went to work, not cut out and assembled, so it missed yet another Playtest session. So instead, I went along purely as a playtester again, and played a couple of games by Dan, the other organizer of the group. First up, seeing as we were the first two to arrive, was Mainframe, a two-player game of head-to-head hacking a corporate network to steal its information. 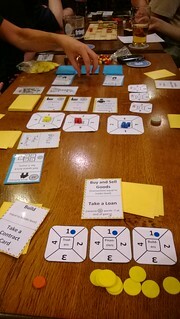 The prototype was fresh back from the White Goblin Games 2-player games competition where it had been a finalist (though didn't win). It was an interesting game which I thoroughly enjoyed. I gave Dan some feedback, with a couple of minor things I'd change the names of and some ideas to make it feel more thematic to me (with my programming background). I found it interesting that as I was playing the game I was thinking what I would do from a graphic design standpoint if I was publishing the game. It took me right back to my thinking during my Reiver Games days when I received a prototype I liked. It also reminded me that a lot of the pleasure I derived from publishing games was working on the graphic design elements of the games to make the as easy to play, attractive and clear as possible. I'm not saying I did a particularly good job, just that I enjoyed doing it. I wasn't able to do the art (Border Reivers is proof of that), but I did do the graphic design. After Mainframe, we played a couple of games of Samizdat, Dan's game about publishing illegal books in 1950s Russia. We'd promised to play each other's games - I'd play Samizdat and Dan would play Vacuum, but with Vacuum languishing at home, uncut, we just played Samizdat twice. It was another good game, a bit more involved than Mainframe, but everything tied nicely together. It was the first outing of this particular version, and we spotted a couple of things that didn't see much action (and hence were probably a bit weak) and Michał was keen to have the variable turn order reinstated from a previous version. Another enjoyable game, and both in pretty good shape too. Since the weekend, The Daughter had been sleeping better, so despite a late night on Tuesday at the playtest session, and another late one planned on Thursday for my regular Games Night I went all out and had a late night on Wednesday too - three on the trot! - and cut out and assembled the new version of Vacuum. One day too late for the Playtest session, but it did mean it was ready for Games Night where Wilka, Dave and I played and also for the lunchtime session on Friday with Chief and Dave. Chief couldn't make it in the end so Dave and I ventured out again, just two player. Of course, after my three late nights on the trot, The Daughter came down with another fever, so Friday and Saturday nights were pretty bad, and the weekend was a bit of a wash out. I did fix a couple of errors I found on cards in the new Vacuum though, and started to make some improvements to the graphic design of the event cards. I now have the replacement power lead for my laptop, so I've been able to finish making the requisite changes to Codename: Vacuum. I didn't finish them until this weekend with the printing and assembly booked for this evening, since at the beginning of the week The Daughter was ill and not sleeping well as a result. In a bid to survive the working week we went to bed pretty early to try to get some sleep, which left me with very little time in the evenings to make the changes, print them out and then cut out and assemble the prototype in time for Thursday. I'd planned a playtest session on Thursday lunchtime and I'd intended to have it available for Games Night, but in the end I just couldn't find the time to get it ready. It's now been three and a half weeks since my last game of Vacuum, which considering I've been playing at least once a week for a year now feels very weird indeed. In the early days of Reiver Games, I had a full-time job as a Software Engineer which morphed into a project management role. I was hand-crafting the games I was selling (four hundred of them between Border Reivers and It's Alive! first edition) and that took time. I was giving up weekends to go to conventions to sell the games and a good chunk of most evenings either assembling games, checking and responding to emails, doing some half-arsed marketing or designing games of my own. In addition, in the run up to a big convention such as The UK Games Expo, The Cast are Dice or Beer and Pretzels, I'd have to build up some stock to take and, seeing as the handmade games took 1.5 to 3 hours each to create, that was a significant investment in time - so I'd end up using some of my work holiday allowance to spend a couple of days working 12 hour days flat out making games. Games were starting to take over a large chunk of my personal life. Following my MS diagnosis, and the subsequent life insurance payout, one of the driving reasons behind trying to get Reiver Games off the ground properly and running it as a full-time concern was that I'd get my evenings, weekends and holidays back, seeing as I'd be able to do all that stuff during the working day while The Wife was at work herself. So now I was spending all day during the working week working on gaming stuff. Of course, as anyone who's run their own business knows, it's not that easy to turn off when you're the boss. So I still ended up spending a bunch of time on RG stuff in my 'free time'. In addition, all my friends in York I'd made through gaming, and my social life was twice weekly games nights at Paul's house, once a week playtesting evening at mine and frequent trips to Beyond Monopoly on a Saturday. My trips abroad were for Essen. Life was now heavily dominated by gaming. When we moved down south it was a similar story, my friends were all made through gaming, so my social life and my job were both entirely games related. With the demise of Reiver Games I swung back the other way. With the exception of a weekly games night with my friends down south, I did very little to do with games. My work was once again software development, I spent little time gaming and no time designing games or playtesting. Since moving back to Newcastle things have slowly started to swing back the other way again. I've started up my own Games Night once a week and bought a few more games so that I have a decent selection for people to play. I've been designing Codename: Vacuum, spending a few evenings a month doing graphic design on the computer and then cutting out and assembling the prototypes. I've been playing Vacuum once a week on a lunchbreak at work. In addition, in the last few months I've started up the Newcastle Playtest sessions and started attending Newcastle Gamers a bit more often too. Games are once again becoming a large part of my life. But I'm still a more rounded character than I was in the Reiver Games days. My work is software development again, and I spend some of my free time brewing beer and learning to play the guitar. Plus I'm a father now, so I spend a lot of my time entertaining and looking after The Daughter. I often wonder what I would do with Vacuum if I ever get it to a point where I'm happy with it. If it ever reaches that point I'll have to decide - I toy with the idea of hobby publishing again like the early days of Reiver Games, or KickStarter, or approaching the other publishers I know through my days at Reiver Games. But what I come back to is that my family is a far more important use of my time. In the meantime, I'm going to concentrate on getting the new Vacuum printed and cut out this evening, ready for tomorrow's Newcastle Playtest session at The Bridge Hotel, and then working on getting Vacuum to the point where it's 'ready'. That's plenty to keep me busy for the moment. 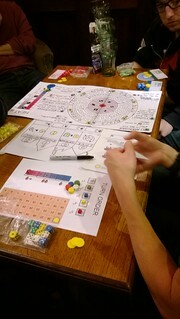 This Tuesday was the fifth Newcastle Playtest session in The Bridge Hotel. With my laptop out of action and my sweeping changes to Codename: Vacuum still a work in progress, I went along purely in a playtester capacity. Although, having said that, I took Codename: Vacuum (the old version) because according to the Meetup page as I left the house that morning there were only three of us confirmed to be going, with me as the only designer. I didn't want the evening to be bizarrely quiet and there be no games there to test at all. Thankfully, Meetup was underselling it. Later that morning, Dan the organizer confirmed he was going and Paul piped up to so there were going to be four of us, and three designers. Vacuum could safely stay in my bag. As it turns out, even that was underselling it. In addition to the three of us and Amo, we had several others who I wasn't expecting: Gareth from Newcastle Gamers came along, Alex joined us and three guys from the Northumbria University Gaming and Roleplaying Society had seen a poster Dan had put up in Travelling Man our local FLGS. So there were nine of us! A new record. And then Lydia joined us later after her other event had finished so ten in total. I got my wish, and Vacuum remained in my bag, unmolested, since between Dan and Paul we had three games. 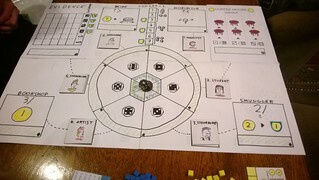 Initially, there were just four of us, so we sat down to play 54 Jones, Paul's game of sci-fi sewage surfing! 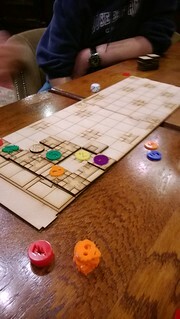 As with Mad Monks, another of Paul's prototypes I'd played a couple of months ago, 54 Jones was a lovely laser-cut MDF prototype with laser-cut perspex counters too. It was a fairly quick, light fun game where you were racing to escape the sewers ahead a wave of encroaching sewage. I really enjoyed this one, and when more people turned up I requested a second play so we played it again while the other table broke out Dan's Samizdat - a game I've been meaning to play since the very first session two months ago. Both games of 54 Jones brought up some interesting ideas, we tried one in the second game, which I think improved it and Gareth had a really good idea after the second game (though that would have involved some component changes so it couldn't be tried out on the night). At the end of the second game of 54 Jones (which slowed down a bit due to very aggressive play), we broke up again and swapped around a bit. I moved to Dan's table and tried his other game: Galactic Contractors. This is a very early prototype (I think Dan said it had only been played three times!) but already it felt like a solid game. There were plenty of options and some very interesting mechanics. From what I remember Dan said he'd come up with the mechanics first for this one, hence the theme being a little flaky at this early stage. Nevertheless, I enjoyed it, and would like to play it again.